Starting to feel a little stressed out now. This is what the entire month of August feels like to me. Did you ever watch The Price is Right - the real one, with Bob Barker, not Drew Carrey? The month of August to me feels like I'm the yodeling mountain climber from the game Cliff Hangers. My stress level starts out low at the bottom of the mountain because I'm in summer mode. Each day of August I am climbing the mountain and my stress level rises. There is just not enough hours in the day to get everything ready and still enjoy the end of my summer. I feel like at any moment I might just fall right off the cliff. I think we all have that level of stress as a new year approaches. 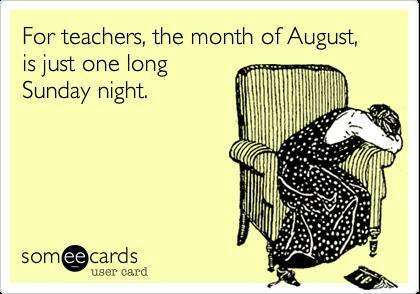 We dream about it being the first day of school and we forgot to make their name tags ....or you don't have your lesson plans done ....or you are naked! However your anxiety plays out for you, I think we must all share some of the same feelings. In an effort to help myself through these moments of uncertainty, I am trying to get somewhat planned and ready for at least the first month and a general guideline for the rest of the year. 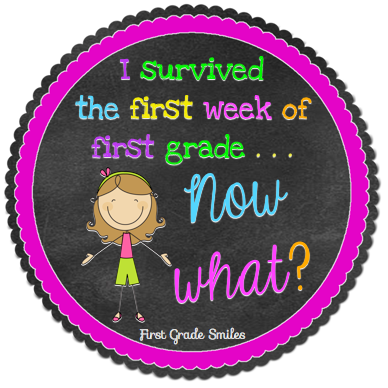 Last week I posted about the First Week of First Grade and what I plan to do. 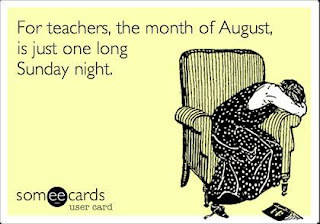 So even though I don't have myself totally together to join in on Teacher Week, I still have been thinking NON-STOP about what I will be doing this year. So I guess this is my form of organizing for teaching and the Now What? follow-up to that post. Here are some things I have planned for the Now What? phase of back to school. I hope you are able to find some ideas that could help you too. As you scroll through you will find a couple freebies, so be sure to check those out and a chance to win some of these items at the bottom too. 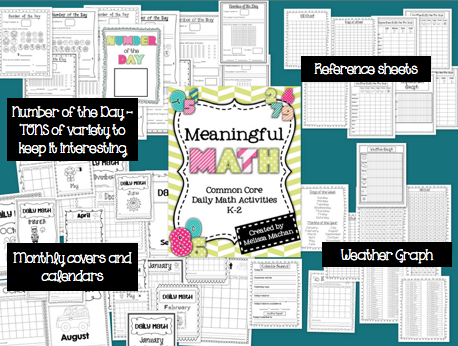 First up is my Meaningful Math pack. This is what I will use during our morning meeting slot. 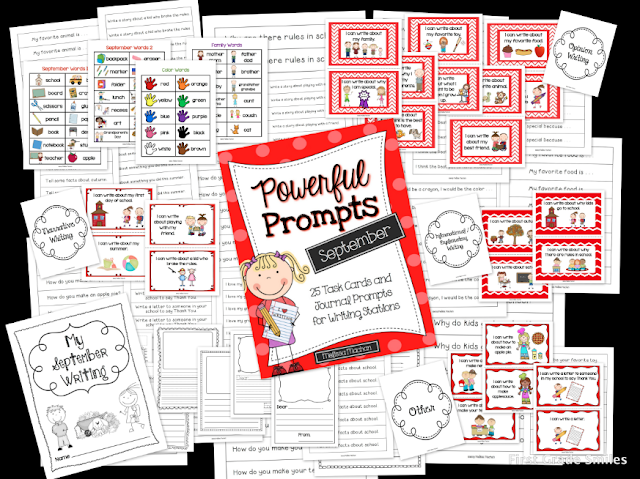 I will make a packet for each month that will include a cover, daily calendar journals, weather graphing, and number of the day papers. In the back of each packet will be reference pages to help them. 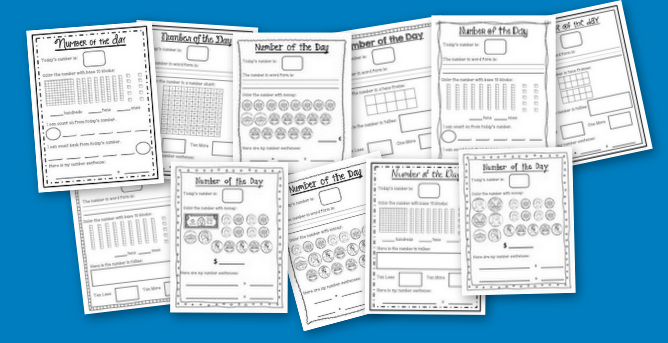 I've included a variety of skills in the number of the day pages so I can improve that number sense in my students and build up in difficulty throughout the year. This year I am trying something a little new with math. Last year during center time I had a math center that the kids would go to once a week and I changed it each week. This year I decided to start teaching math in small groups and have a time for math stations that was separate from my literacy stations. I'm really excited for what I think could come with this and will hopefully see some huge improvements in my students' mathematical understanding. 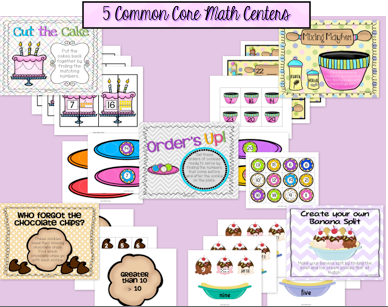 I will also be using my Common Core Math Centers during math stations. 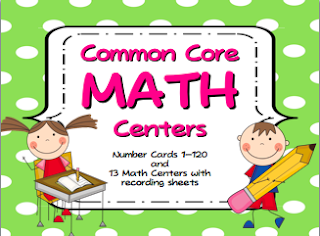 I love these centers because I can use and reuse these all year long and make them brand new by just changing the numbers or the problems in each center. There is a ton of variety and choices within the centers so you can switch it up or even differentiate for different levels. 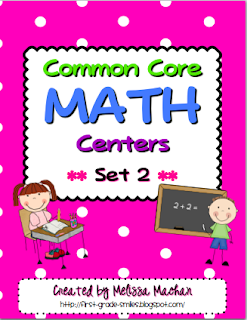 These centers cover the Common Core standards of Operations and Algebraic Thinking and Numbers and Operations in Base Ten. Click on the pictures to see more. 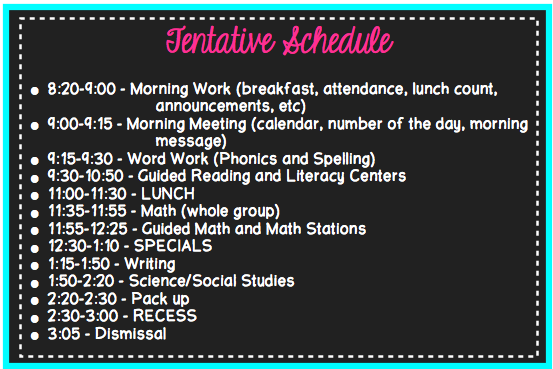 For my literacy centers I will have a word work center (or 2) and a writing center every week. I am also planning an iPad center and a listening center. 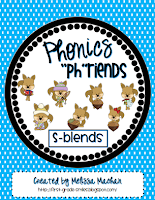 For word work I will be using my Phonics "Ph"riends packs. 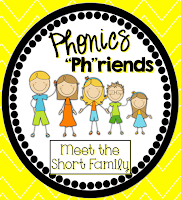 I love teaching phonics by connecting it to characters and their stories. 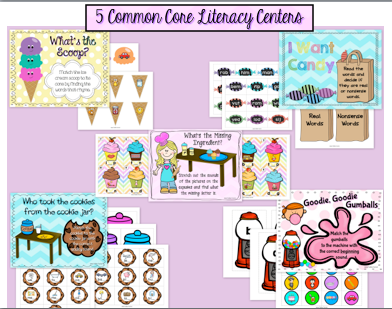 These packs have between 5 and 9 literacy centers within them. There are also mini-books and practice pages as well. Click on the pictures to see more about them. This one is a freebie in my store if you want to go grab it for some Tw practice. I plan on making these for each month and can't wait to have this structure of a writing center set up for me. 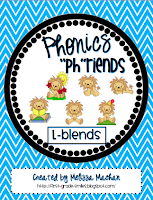 This pack includes all different types of writing: narrative, opinion, informational, and others likes letters and how-tos. In the beginning of the year I will keep it structured and have them work on a specific prompt at center time, but I'm hoping as the year progresses to be able to leave the task cards at the center and allow them some choice on what they want to write. Now if you made it all the way down here, you can be rewarded with ANOTHER freebie. This is a bingo game I plan on playing that first week of school and maybe even again later on. 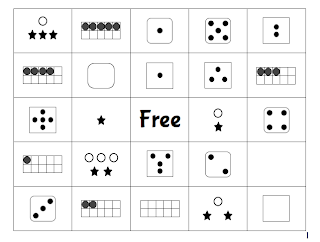 It is for recognizing different representations of numbers. These boards are 0-5 and I'm hoping to make some more for larger numbers as well. You'll need to make a 0-5 number cube/dice but you could easily just cover up the 6 on a dice with a small circle label and that would be zero. Click on the picture to download this one. Well I hope you were able to get some new ideas and grab some freebies, and maybe, just maybe, you feel a little more prepared for the Now What? If you have any questions about anything I posted, don't hesitate to leave a comment or email me at mmachan16@gmail.com. I'm super excited about starting off the year with a pretty good plan of how I will get going and I will most certainly have some updates with photos once school starts. Oh - one more thing ---- I am going to make this a Pin It and Win It kind of day! Here's what you have to do - Pin any item that you would like from this post (you can pin as many as you'd like). Leave a comment with the pin URL below and your email. I will pick winners on Sunday. Here's how I'll do it: If I get 25 or less comments I will pick 1 winner. If I get 26-50 comments I will pick 2 winners. If I get 51-75 comments I'll pick 3 winners. And over 75 comments ---- I will pick 5 winners!!!!! Happy back to school!!!! Less than 3 weeks of summer left for me! Your post are always interesting and full of creative ideas. Thanks so much. I love all of your ideas. 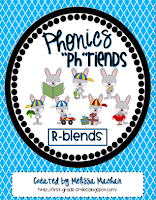 They have definitely helped me with my first year of teaching first grade! Thank you for your creativity! Thank you for the bingo boards! 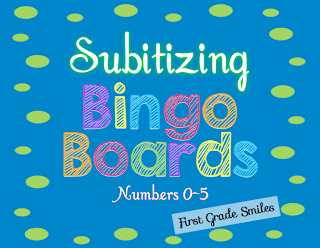 Love the subitizing bingo! Thank you so much. Would it be wrong to play the song while the students are working on the Pour Some Sugar centers?! Haha! 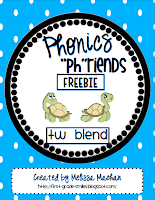 Thanks so much for the subitizing bingo freebie! Just went to a fabulous Singapore Math workshop and subitizing was a hot topic. This is perfect! 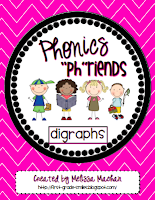 Totally looking to build number sense this year with my firsties. They know math procedures, but don't seem to understand the why behind them!